The pieces for this mosaic were entirely made and cut from clay by hand. Each piece measured and then glazed, then fired in the kiln. This was all done under the watchful eye of the Pottery teacher Mr Paul Sellers. The picture template was drawn out on a large sheet of paper and then each piece was placed face down on the drawing. The pieces were secured with ‘Syrup’ to stop them moving. This then enabled the paper to be removed easily by wetting the paper to release it. 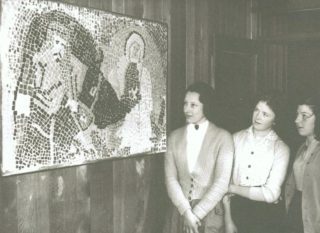 The gaps in the mosaic were then filled with cement to enable the mosiac to be displayed outside and withstand cold temperatures. 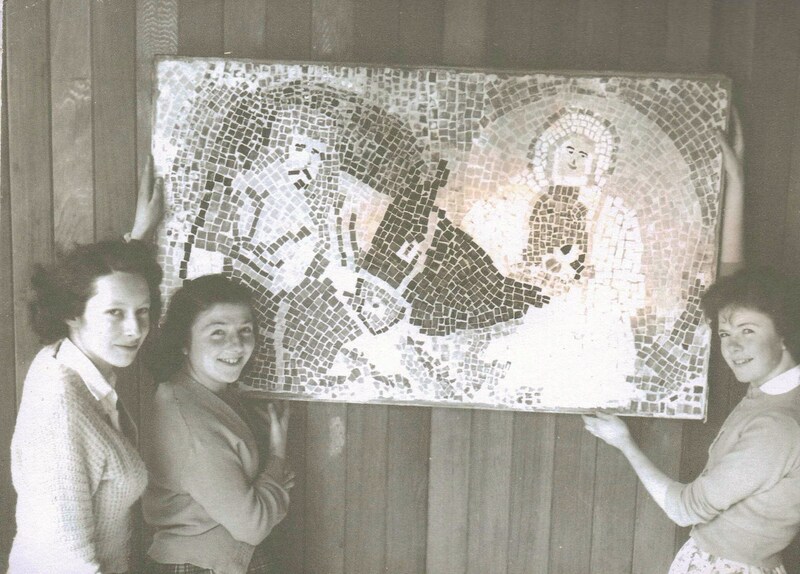 This mosaic remained intact and on display outside ‘Anson’ block at Clarendon School (later becoming Sir James Altham) and still remained there after the school was closed and the building was then used as a ‘Day Care Centre’ for the elderly. I remember taking my own children to see it during the late 1970’s. It was finally removed when the Day Care Centre was refurbished. Yes, I do remember the splendid mosaic and working with the estimable Paul Sellers during my time at Clarendon in the first half of the 1960s. Incidentally, Sue, I was able to recognise you instantly in these photographs, so ye haven’t changed that much in more than half a century and fair play to ya! !